Last of the 2017 gym posts. Previous posts: deadlift, overhead press, and bench press. 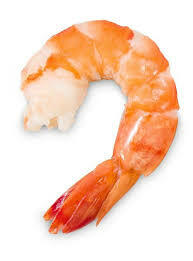 This one is weird. I hate this lift. My squat has never felt comfortable. I’m constantly fighting to improve my form but issues keep popping up like Whac-A-Mole: squat not deep enough, knees buckling inward, lower back strain, etc. 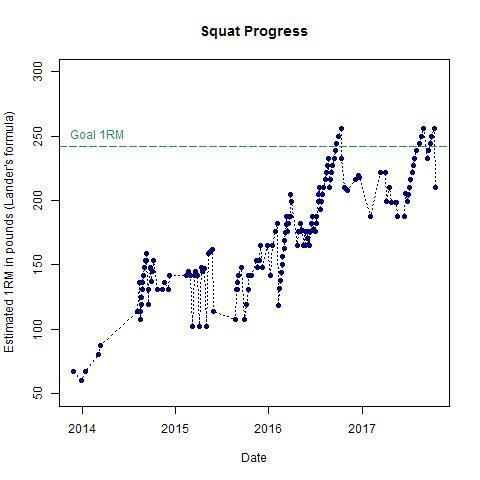 In my first two years of squatting, I was reluctant to increase weight due to form concerns. By 2016, I came to a decision that has lead to great progress: even if form wasn’t perfect, increase the weight if form was acceptable. My squat still feels awful, but its got nearly 100 more pounds on it now than it did before. I technically hit my 2016 goal at the end of 2016 when I was motivated to reach 225 lbs (two 45 lbs plates on each side). 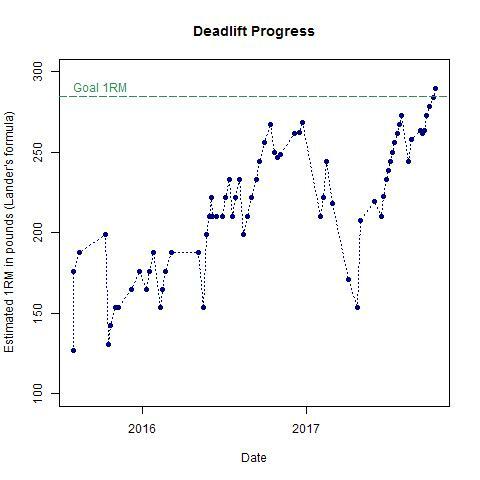 However an injury while deadlifting at the end of 2016 caused me to halt progress. I’ve only recently started working back up, again (most recently hitting 225 lbs × 5 reps at sub 150 lbs body weight). Now that i’m regularly doing reps of ~200 lbs, its ridiculous to think that there was ever a time where the most I could do was 60-80 lbs. I don’t know how interested I even am in pushing this lift much higher than where it is. I like the idea of having a strong squat for functional strength and hockey…but I do not like the idea of having to buy larger pants. Post 3 of 4. Previous posts: deadlift and overhead press. The bench press might be my favorite compound lift. It was the first compound lift I started training. Progress has been slow, but I managed to hit my 2016 goal last week (165 lbs × 5 reps at sub 150 lbs body weight). I think I graduated up a shirt size around the end of 2014. All of 2015 looks like it was a huge waste of time. I wasn’t consistently on the same program or training schedule so that whole year just looks like it was “maintenance”. Next couple years weren’t awful. Slow but steady. The deadlift is tied with the squat for my least favorite lift. It’s the lift that I’ve been training for the least amount of time and also train with the least frequency. These days, I deadlift no more than two sets a week (as per my Greyskull LP program). 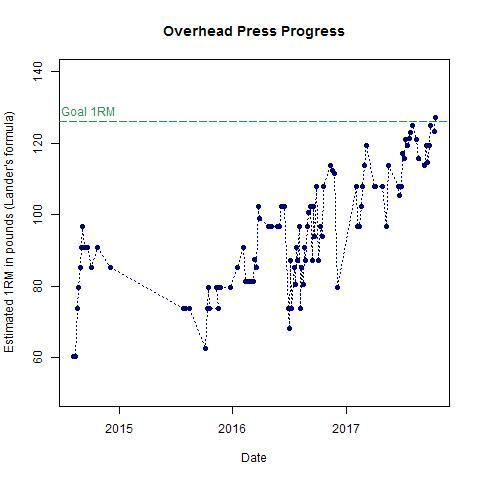 I am interested in continuing to make progress on this lift but probably won’t increase frequency until I’m ready to move on from Greyskull. 2016 didn’t look terrible, but I can see the point at the end of the year where I injured myself deadlifting and it affected my psychologically well into 2017. 2017 by itself looks crazy. Thanks Greyskull. Last year, I set some weightlifting goals for myself for four compound exercises: bench press, overhead press, deadlift, and squat. These days, I’m hovering right around the goal weights that I set. I thought it would be fun to break down how things are going for each lift, starting with the overhead press. This also gives me a dumb excuse to play with R more. First, some quick background. I started casually training summer of 2013. I was weak. Between then and the end of the year, I slowly got my lifts up, but I still had a long way to go before I would even be comfortable with telling anyone my numbers. The period between 2014 and 2016 could best be described as me having “F***arounditis”. I continued to go to the gym in the mornings but would very regularly skip days due to not waking up early enough. If I did make it, I only gave myself 20-30 minutes to get any work in. I’d have spurts of motivation from reading things on /r/fitness or /r/gainit, but never any real consistency. I did make improvements, but it was messy. At the start of 2016, I signed up for a new gym after a move. This was the start of more consistent training and was the period where I’ve made the most progress. My consistency wasn’t perfect, but it was the best year so far. It was then that I set some strength goals, something I really should have done on my very first day. The goals motivated my consistency and it was the consistency that brought progress. For goals, I settled on the intermediate column in this website’s list of strength standards. For example as a 150 lbs male, a one rep max of 122 lbs for overhead press would put me into the intermediate column, which is defined as being above the median strength for lifters of my same weight. Not awful and no longer “below average” so that’s good enough for me. It took me much longer than it should have, but I hit this today (105 lbs × 7 reps at sub 150 lbs body-weight). 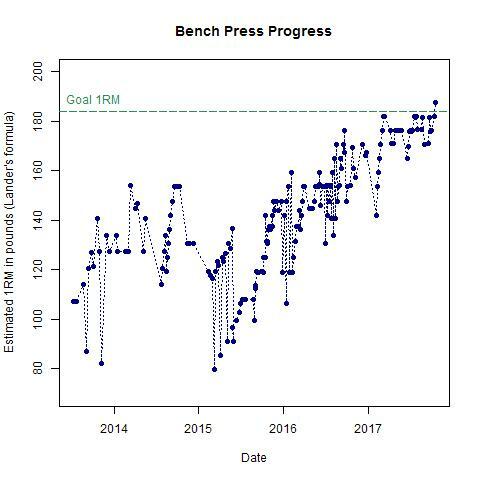 Here’s how my progress looked for this lift (from the last couple of years of data). Note that I use an estimated 1 rep max (using Lander’s formula) which uses a weight × reps × some coefficient formula to estimate a 1 rep max. I’m definitely embarrassed about the lack of consistency before 2016. The increases in the start of 2016 are largely thanks to me half-following a 5×5 lifting program. I say half-following because I was not increasing the weight as regularly as I really should have. For this, I partly blame the gym for not having 2.5 lbs weights for increases (smallest plate they had were 5 lbs plates and full 10 lbs jumps are hard). I started following the Greyskull LP program in the summer of 2017 and I HIGHLY recommend it. One problem with other programs is how discouraging it is to fail a set. Failure means that you must drop the weight and it’ll be weeks until you work back up and get a chance to set a new personal record. Greyskull fixes this by having the final set be an AMRAP (as many reps as possible) set. To illustrate, if I fail a lift at 150, I must drop the weight to 135. However, if the last time I was at 135, the best I could do was 5 reps on the last set, I can now strive for 6+ reps to beat my old record. This is a GREAT design addition. Consistency above everything else. Don’t skip sessions and give yourself plenty of time to finish everything. Pick the right program and follow it as best as you can. Greyskull > 5×5. (Related to #2) If the program says to increase the weight, do it. I had many sessions where I sat at the same weight for several sessions in a row. This was a mistake because failure is part of the design of each program and the overloading is necessary. In future posts, I’ll share the graphs of my other three lifts.